How to design and use a scalable, robust naming convention for your organization and clients. While many organizations start out naming their devices as Greek gods or fictional characters, it's not scalable in a large organization. It's better to have a solid naming convention set up than it is to run out of Greek gods when your business starts to bloom. In this design process, you'll create your own naming conventions for your IT assets that is scalable, readable, standardized and flexible. To illustrate, here are some diagrams of example naming conventions. Read on to create your own, or check out this introductory video for more information. Every organization can have its own naming convention. The complexity and variability depends on the size of the organization and its number of devices. In this section, you'll create a robust and scalable naming convention for an organization of any size. The next step is to decide on the third letter. This will be code for the particular building where the device is located. If necessary, you can also use a letter to define the type of device. To improve readability of the device name, use a delimiter to separate the device location from its other specifics. In case your system doesn’t support a dash, you can use another standard character such as # or $. In the next step, you’ll add information to the 2nd half of the name to make the name unique and more descriptive. Decide on the primary purpose of all named devices, and their abbreviations. For more ideas on efficient device purpose names, see this article from University of Waterloo. Office buildings could have multiple physical databases, so it’s important that they are all labelled with a unique ID number. For example, there can’t be two physical database 01s in your Los Angeles block A (LAAP-FS01) — so you name the 2nd one LAAP-FS02. Some systems have specific requirements for naming conventions. For example, Active Directory doesn't allow device names over 15 characters, and some systems have problems with special characters. In this section, we'll make sure the name is valid with the system you use. A naming convention that allows for duplicates is useless. Use a spreadsheet or text pad to identify duplicate lines in your device name list. In cases where your system doesn't support non alpha-numeric characters, you may have to remove delimiters and other special characters. Spaces cause problems with most systems. 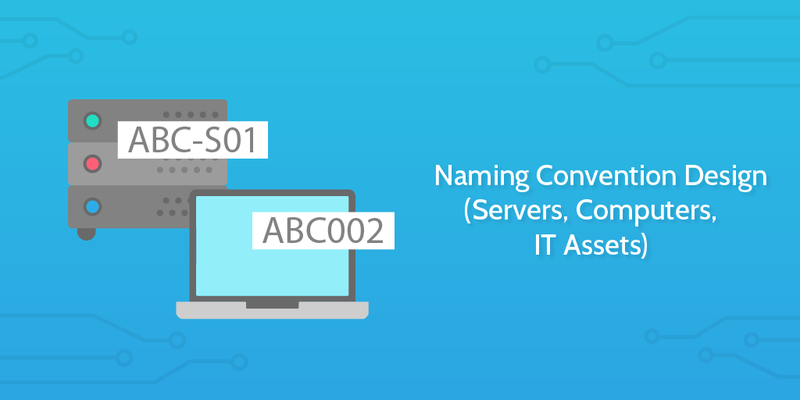 Naming conventions can't be one-size-fits-all for every organization. In some cases, you might need to adjust the convention to allow for personal devices (like Joe Bloggs' mobile phone) as well as company devices (like Infinite Loop's C Block Server #43). The following section will help you adapt your naming convention to allow for both devices. Instead of a device’s primary purpose after the delimiter, use the username of the device’s owner, then use the last two characters of the name to specify which kind of device is being named. Where BenB is the username, and LT refers to the user’s laptop. Since personal devices are assigned to users, not just physical locations, a username should be tied to the code of a specific device type. Multiple devices of the same type can be identified with a 2-digit suffix.